Nathanial Martinez is a natural ADVOCATE who fights for his clients and gets results. Whether inside or outside of the courtroom, Nathanial understands the importance of having a great communicator in your corner and his natural talents make him the ideal person to represent clients with a variety of legal challenges that may not always get resolved before trial. State Bar of Texas; U.S. District Courts for the Northern, Southern, Eastern, and Western Districts of Texas. Nathanial Martinez is a business lawyer who practices in both state and federal court. He handles a variety of employment, construction, oil and gas, and general commercial litigation claims, including wrongful termination, unemployment benefits, subcontractor and general contractor disputes, breach of contract, breach of fiduciary duty, fraud, unfair competition, tortious interference, conspiracy, and misappropriation of trade secrets. Mr. Martinez also represents a variety of construction-related business owners and health care providers before state agencies, including the Texas Workforce Commission (TWC), Texas Department of Licensing and Regulation (TDLR), Equal Employment Opportunity Commission (EEOC), the Texas State Board of Dental Examiners (TBDE) and the Texas Health and Human Services Commission (THHS). Mr. Martinez received his bachelor's degree from The University of Texas at Austin (UT) and his law degree from Brigham Young University (BYU). ***Texas Super Lawyers has named Nathanial Martinez on its "Rising Star” list for five consecutive years -- 2014, 2015, 2016, 2017 and 2018. To compile this list, research firm Thomson Reuters seeks nominations from the over 80,000 attorneys practicing in Texas, and selects finalists through a patented, multi-phase process. While up to 5 percent of the lawyers in Texas are named to Super Lawyers, no more than 2.5 percent are named to Rising Stars. To be eligible for Rising Stars, a lawyer must be 40 years old or younger, or in practice for 10 years or less. • Represented Dallas-based leaf spring supplier in Texas federal court on breach of contract, breach of fiduciary duty and non-delivery claims against prominent logistics company, securing a favorable jury verdict on all claims and an award of punitive damages. • Represented individual in state district court in Dallas County on breach of employment contract and fraud claims against former employer, securing a favorable verdict on all claims and an award of punitive damages. • Represented former officers and managers of beer and wine distributor in state district court in Dallas county on claims for breach of a change in control clause in an employment agreement against former employer, securing a favorable multi-million dollar verdict. • Represented country club owner in a jury trial before a county court in Corpus Christi, Texas on claims for business disparagement and breach of contract against sitting city councilman and title company. • Represented telecommunications company in complex accounting dispute involving claims for breach of partnership agreement and fraud. • Successfully obtained favorable settlement of a case involving claims against a school district for racial discrimination and wrongful termination. • Served on litigation team representing U.S. manufacturer and distributor in pursuit of claims against former international licensee for breach of contract, breach of fiduciary duties, fraud and misappropriation of trade secrets. • Represented citizen complaining about at-large re-districting in a North Texas city council election before the United States Department of Justice. • Represented employers in responding to complaints by former employees before the Texas Workforce Commission, including responding to improper claims for unemployment benefits. • Represented dentists and orthodontists in responding to complaints by former employees and patients before the Texas State Board of Dental Examiners. • Represented dentists and orthodontists in responding to complaints by former employees before the TWC and EEOC. • Represented IT consulting industry clients in arbitration proceedings against middle tier and top tier clients for breach of contract and quantum meruit. • Obtained numerous confidential settlements for clients in the IT consulting industry based on breach of contract claims. • Obtained numerous confidential settlements in favor of clients in connection with a variety of employment disputes in multiple industries, representing both employer and employees. • Obtained numerous settlements for credit card and consumer debt defense clients. 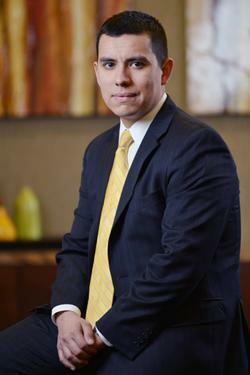 Texas Super Lawyers has named Nathanial Martinez on its “Rising Star” list for 2014, 2015, 2016, 2017 and 2018. Nathanial believes in the value of serving his community. He has previously served as Crew Leader for his local Boy Scouts of America unit and as a Merit Badge Counselor. Nathanial regularly volunteers at the East Dallas Legal Clinic, and also serves on the local governing body for his church in Frisco, Texas. Nathanial is an avid runner and marathoner and enjoys indoor rock climbing with his daughters and soccer with his son. When he is not serving his clients or volunteering at church, Nathanial spends time with his family and reads science fiction.